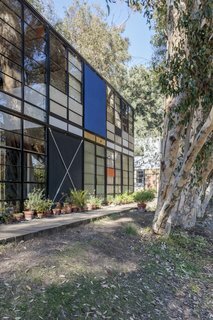 The Eames House, one of the world’s most treasured and influential modernist houses, enters a new and improved chapter of conservation as it turns 70. 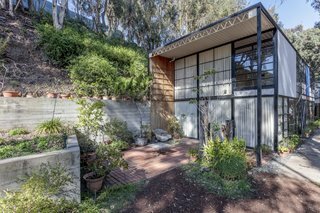 The Getty Conservation Institute (GCI) and the Eames Foundation just unveiled their Conservation Management Plan (CMP) for the Eames House, a couple months ahead of the midcentury-modern icon’s 70th anniversary. A cross-disciplinary team of heritage specialists from Getty Conservation Institute and Sydney-based GML Heritage prepared the plan, which outlines policy guidelines for not only conserving and protecting the National Historic Landmark for future generations, but also improving visitor access and education. 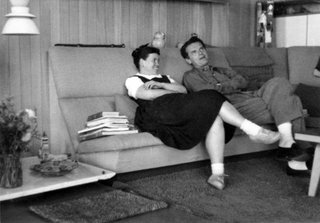 Ray and Charles Eames seen standing on the steel frame of the house, which consist of two rows of 4-inch H-columns set 20 feet apart. A 12-inch open-web joist forms the top member. 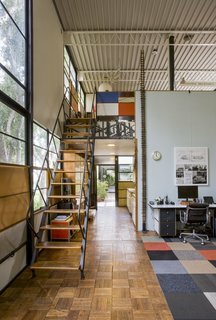 Built in 1949 as part of the Case Study House program, the two-story home and artist’s study that Charles and Ray Eames designed—and lived in for nearly 40 years until their deaths—is an ingenious work of prefabrication and an exercise in efficiency. The home’s simple shell consists of two steel-framed boxes, and it only took five men and 16 hours to complete. The light-filled interiors are as delightful as the colorful facade; the large, flexible rooms and double-height spaces share a strong connection with the outdoors. 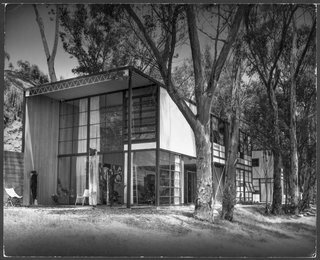 The Eames House as it appeared in 1950. Charles and Ray had intended to build two separate buildings (the house with ocean views and a hillside studio), but the couple fell in love with the beauty of the site and decided to build the structures together to conserve the landscape. 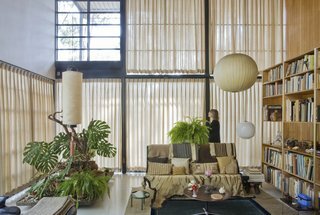 Set on a 1.4-acre site atop a bluff overlooking the Pacific Ocean, the Eames House comprises a 1,500-square-foot "living" volume and a 1,000-square-foot "working" volume separated by an open court. 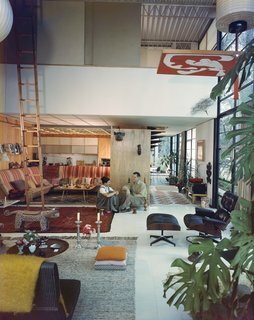 Today, the Eames House is owned by the Eames Foundation, a non-profit established by Ray and Charles’ grandchildren who are dedicated to preserving the house as it had existed when the couple lived there. 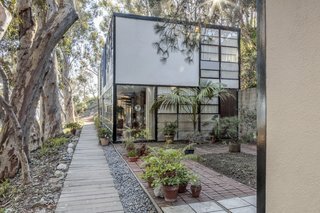 Had the Eames Foundation not been established, the house might have been demolished long ago, as it sits on large and valuable land in the affluent Pacific Palisades neighborhood. 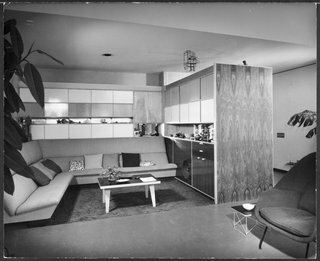 This photo from 1950 shows the living room alcove with a custom built-in sofa, cupboards, and cabinetry. Ray and Charles relaxing in the living room alcove. 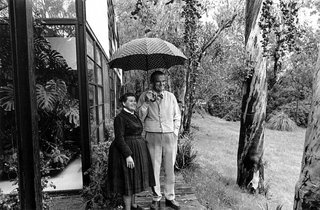 Yet despite consistent maintenance by the Eameses—beginning with Charles and Ray, their daughter Lucia, and today by the Eames Foundation—the house was in danger of succumbing to age and the elements. 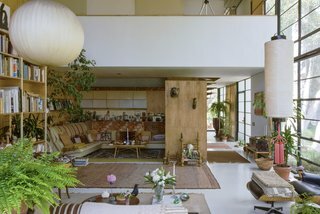 In 2012, the Foundation partnered with GCI to create a long-term conservation strategy for the Eames House. 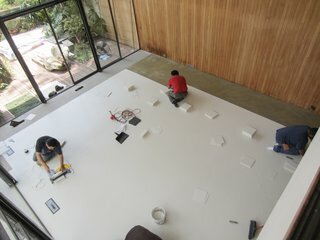 The wall panels are strategically placed to allow light into certain spaces of the home at particular times of the day. "The honest expression of structure and the creative use of color, texture, and varied materials are among the attributes that demonstrate the aesthetic significance of the building complex," says the CMP team. The south elevation of the studio. 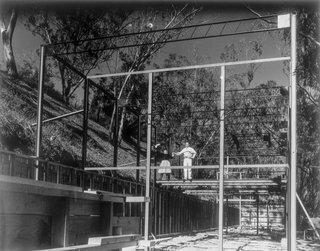 Note the variety of materials used; Ray and Charles used a mix of panels made from plaster, plywood, asbestos, glass, and fiberglass-like "pylon." 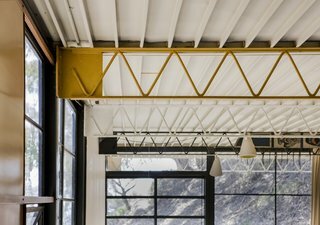 GCI’s Conserving Modern Architecture Initiative team spearheaded the effort and helped fund the six years of research that went into developing the Eames House Conservation Management Plan. "In developing the Conservation Management Plan, the team started with the history of the house and its design, its physical features, and how the house embodies Charles and Ray’s creative spirit. 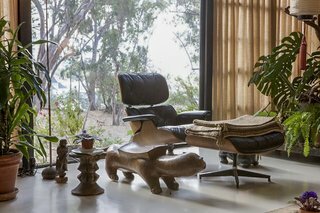 From there, it identifies what is significant about the Eames House and presents policies that will protect this significance," says Chandler McCoy, a senior GCI project specialist who manages the Eames House conservation project. "The plan will be a vital tool in the creation of a long-term strategy to ensure that the house may be enjoyed by visitors well into the future." Paint excavation studies revealed the history of paint applied to the home. The team also discovered an early warm gray paint layer that suggests Ray Eames mixed the paint by hand. As part of the CMP process, the severely damaged square vinyl-asbestos tiles in the living room were replaced with vinyl-composite tile flooring. Not limited to the house and landscape, the holistic scope of the Conservation Management Plan also considers Charles and Ray’s belongings, which have been meticulously kept in their original locations to recreate the home as it was at the time of Ray’s death in 1988. A 1958 photograph showing Ray and Charles in their living room. The CMP team catalogued the carefully preserved objects, textiles and artworks that the couple filled their home with and created conservation guidelines. Curtains are drawn to reduce light exposure and damage to the collections and contents. 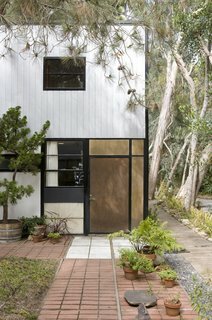 "We want the Eames House to look as though Charles and Ray just stepped out for the day, and working with the GCI has helped us clarify what the site needs in order to meet this goal," says Lucia Dewey Atwood, director of the Eames Foundation’s 250 Year Project, which aims to preserve the house for generations to come. "I’m happy to say that our approach mirrored the iterative process the Eameses used in their designing—they tested several ideas at once, refined and adjusted, then tested again in order to arrive at the best design solution." Ray and Charles standing beneath an umbrella next to historic eucalyptus row that dates back to the 1880s and is still standing today. Pictured is the south court partly sheltered by the roof overhang. Note the rear wood panel wall that creates a continuation from the interior to the exterior. Ray used the exposed concrete planter for growing flowers. A view of the central court with brick, marble, and wooden pavers laid out in a grid pattern. 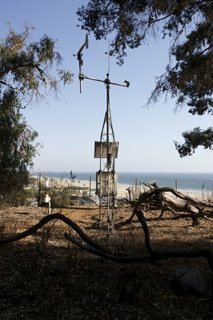 The Foundation installed a weather station at the south edge of the site to monitor environmental conditions, beginning in 2011. A view of the living room, looking north. The overhanging balcony belongs to the bedroom area. A view into the master bedroom as seen from the guest bedroom. 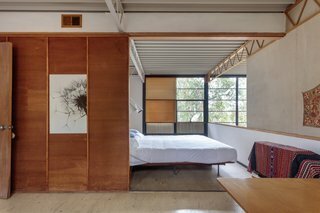 When open, the sliding wood panel combines both bedrooms into one large space. 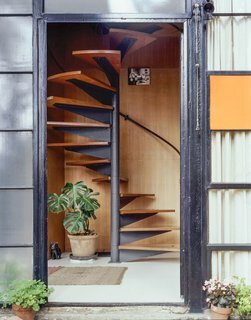 Illuminated by a skylight, the spiral staircase ascends to the bedroom level. The double-height spaces gives the home greater flexibility and a sense of airiness. The exposed web joists were painted different colors, while the ribbed underside ceiling of the Ferrobord roof decking was painted white. A newly replaced Eames Lounge Chair and Ottoman sit in the living room. 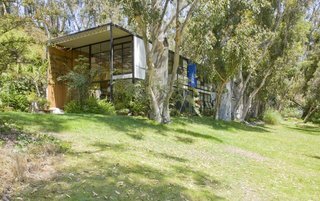 You can read the Conservation Management Plan for the Eames House online.